Georgia might be known for its peaches, but the sunny, southern state has a whole lot more going on than just produce. There is a rich history found here that is deeply rooted in values and tradition, and the folk around just about every corner are happy to see visitors whether they’re familiar or not. Pair this southern hospitality with exciting attractions and beautiful, famous coastal Georgia landmarks and a recipe for a perfect vacation destination is born. Past travelers have spelled out their favorite ten Georgia mainstays to direct new visitors to the best things to do and see in the Peach State. 1. Georgia Aquarium: Given the enormous size and scale of Georgia’s largest city, it’s no surprise that there are a great many attractions in Atlanta for guests to enjoy. What might come as a surprise, however, is that of all Georgia landmarks found here, one of the most well known and most popular isn’t a skyscraper or historic southern building, rather a modern marvel of engineering that houses one of the most incredible arrays of sea life in the world. Over one hundred thousand different watery residents are found here, but they’re all situated precisely in a building that was purposefully designed around the massive whale shark exhibit that the aquarium is known for – the only one of its kind that is not found in Asia. 2. Toccoa Falls: At over one hundred and eighty feet in height, this massive waterfall found just north of the city seems to want to compete in height with some of the structures found in the city. What might be the most interesting thing about this natural feature amongst Georgia landmarks is that it is frequently the recipient of unwarranted awards. Known in many circles as the tallest waterfall in the Eastern part of the country, Toccoa isn’t actually even close! Not by Half! In fact, both Virginia and Tennessee have taller falls. However, this common misconception combined with the area’s charming natural beauty makes it a continual favorite amongst travelers to the area. 3. Helen Bavarian Village: Northeast of Atlanta is a truly fascinating mountain experience that is located near the Chattahoochee River in the Blue Ridge Mountain range. A nearly completely recreated village with a load of Alpine appeal welcomes guests with a rich history steeped in Indian culture and old world charm. There are many things to do around the Georgia landmarks found in Helen including art festivals, shopping, dining and more. However some of the most intriguing activities are annual events like hot air balloon races and wine festivals that bring travelers to the area en masse. 4. Road to Tara Museum: The Stockbridge area is home many tributes to the south, and one popular stop along the Southern Belles and Whistles tour is this museum, a highlight amongst literary Georgia landmarks. Here the famous written piece is honored with movie props, costume reproductions and more from “Gone with the Wind,” along with memorabilia and historical artifacts. The museum is often included along with similar types of stops including a memorial cemetery, the Ashley Oaks Mansion and a plantation or two. 5. 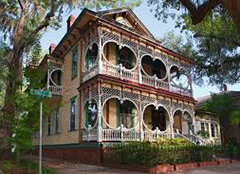 Savannah Historic District: The area that is currently known as the historic part of the southern city is generally regarded as the area that would have been called Savannah in the era before the Civil War. What brings tourists to the area are the well preserved historic buildings and common garden spaces found in the city. There are several important Georgia landmarks found here including the Colonial Cemetery, Old Harbor Light, the First African Baptist Church and many more. 6. Tybee Island: A bit east of the historic district of Savanna on the eastern coastline can be found the state’s easternmost point, a barrier island named Tybee. The island is known for many things including an annual parade of water gun toting beach bums and a rich Native American past, a complete mess up is what has made the island famous amongst Georgia landmarks. In the 1950s, an atomic bomb was accidentally dropped on Tybee during training exercises by the United States military. The bomb, of course, did not detonate. 7. St. Simons Lighthouse: Southward from the barrier island that almost wasn’t is the lighted beacon that directs ships around the gauntlet of sandbars awaiting them in St. Simons Sound. The original structure was built in 1810, but was replaced in the 1970s, then outfitted with newer, state of the art lens technology. However functional, it’s not always the purpose of this lighthouse that makes it a favorite amongst Georgia landmarks for tourists. The tower is purportedly haunted by it’s former light keeper, who was killed in a duel with his assistant. 8. Jekyll Island: A hop skip and a jump south from the pair of lighthouse guarding ghouls is another barrier island that is known for its charming historic district and natural, scenic landscapes. In particular, an area known as St. Andrews is one of the most popular of all coastal Georgia landmarks with tourists. While the beach is stunning and the area rich in history, it’s the resident dolphins that are common at the beach that make it a popular recreational and picnic area. 9. Cumberland Island National Seashore: Even further south than the barrier islands, this seashore, the largest of the Golden Isles is popular for not only salty sea fronts, but also lakes of cool, clear fresh water. Unlike many other coastal Georgia landmarks, this National Seashore is only reachable by boat, and there is no pedestrian or vehicle access. There is a ferry to transport guests over, however space is very limited, and past guests recommend reservation. There is little doubt that few places in the world are like this small island, however its exclusivity might be as alluring to travelers as the landscape is. At any given time, only three hundred people can be on the shore at once, ensuring a quiet and relaxing stroll along some of the most beautiful seashore in the world. 10. Providence Canyon: Away from the big city lights of Atlanta and shy of the glistening sea shore in the east can be found a canyon that seems utterly out of place here, looking more like it belongs in Arizona than amongst Georgia landmarks. And, that’s probably what brings guests to Stewart county to see the thousand acre park, which is affectionately called “Georgia’s Little Grand Canyon.” Camping, picnicking, hiking and more are popular here, but big draws are astronomy events and geology events, both which are incredibly popular at the canyon.